If you stop by Picture Book Builders occasionally, it’s no secret that I adore picture book biographies, and also love science. 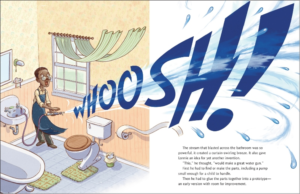 Recently, I discovered a new picture book I can’t wait to share — WHOOSH! 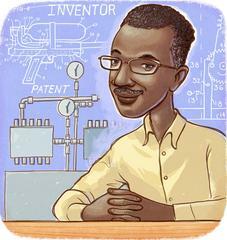 LONNIE JOHNSON’S SUPER-SOAKING STREAM OF INVENTIONS (by Chris Barton, illustrated by Don Tate.) And as luck would have it, a few weeks ago I found myself seated next to the talented Don Tate at an SCBWI dinner. Coincidence, I think not! 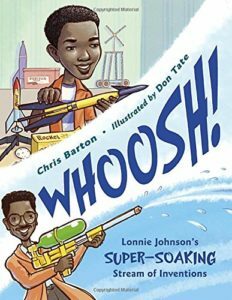 So this month I’m very excited to feature WHOOSH!, a picture book gem which shares the true story of how NASA engineer, Lonnie Johnson, invented the Super Soaker water gun. The engaging text includes quotes from inventor Lonnie Johnson (who’s still living.) It also cleverly introduces readers to scientific terms such as “prototype,” while emphasizing the importance of persistence in the invention process. No doubt, kids will love WHOOSH! LONNIE JOHNSON’S SUPER-SOAKING STREAM OF INVENTIONS (Charlesbridge), and with starred reviews from Kirkus and Publishers Weekly, reviewers and other adults will love it too! Charlesbridge Publishing, Chris Barton, Don Tate, inventor, Whoosh!. Bookmark. Thank you! What a fun book to share. And thank you for stopping by, Mary Jane! Glad you enjoyed the post. Kids will love this book-I will love it! Thanks for introducing me to it. I think you’ll love it too, Mona! Thanks for visiting PBB. My three “kids” are in their late 20s, early 30s, and I think THEY would love this one. I couldn’t even guess how many hot summer afternoons they spent stalking one another, super-soakers at the ready – back in the day. Thanks for this one, Suzanne (and Chris and Don!). I know, such a great book idea. Wish I’d have thought of it! Isn’t Don a great speaker (as well as illustrator!) Glad you got to meet him. Yes, this book is right up my alley! Thank you for a good post! Thank you for sharing the story. Glad you enjoyed the post Terri! And thank you for stopping by! The Super soaker is a classic! This is one that all generations will want to read. Grandparents, who’s children had them, parents, who had one themselves, and kids, who want one if they don’t have one yet. So true, all generations know about the super soaker, and everyone will be curious to learn how it was invented! Looks like a great biography and lots of fun! It’s a whole lot of super soaker fun! Such a great idea for a children’s book! I guess we should take aptitude tests too seriously! Good point! Those tests don’t mean much compared to a person’s determination and will! Lonnie proved that so well! Super soakers and books are both popular at our house so reading this one is a given!! I’m sure you’ll enjoy it LeeAnn. Such a fun book on an interesting topic! I’m sure you won’t have any trouble finding the book, and I’m also sure you’ll enjoy it. Thanks for visiting PBB! I love this book. 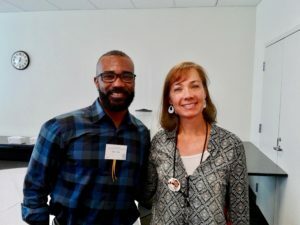 Don spoke at a Highlights workshop in September. I agree, he’s a great presenter and illustrator. Chris Barton isn’t so bad either. Don is a busy guy! I’d like to meet Chris someday — our paths haven’t crossed yet. Thanks for stopping by! Kids–and adults–will love this book! What a fun cover. It draws the reader right in. I met Don Tate at a Highlights Chautauqua workshop years ago and also saw him at the recent Illinois SCBWI conference. He gets around! Yes, he’s a busy guy. I agree, the cover is perfect for the book — lots of action! One of my favorites too. That’s cool you got to meet him! It’s so great to meet other writers and illustrators. We sit home alone working so much it’s a real treat to see each other at conferences and such and chat. 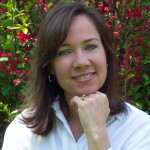 Thanks for commenting Susan! Hope your writing is going well!